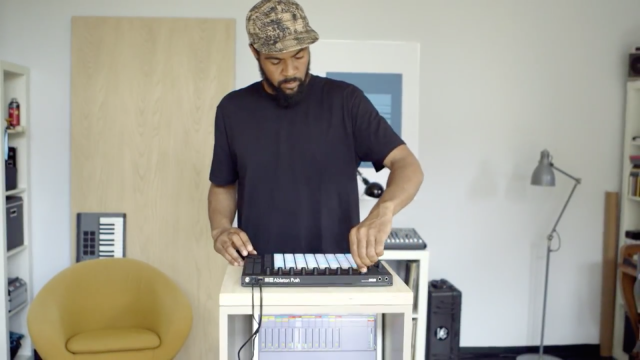 Jesse Abayomi, Ableton Product Specialist, is one heck of a virtuoso Push player. And you can learn something from him, too. Performance technology doesn’t always add to performance, it’s true. But when the machine and human are in sync, it’s beautiful. People can develop their musical chops and machine control chops at once – improve on their musical practice and technique. And when that happens, the quality of performances actually gets better. I’ve seen a funny thing as Push has crept into performances. Just as with the spread of custom controllers in the past, access to more playing technique has livened up live sets. It literally makes it more fun to be an audience member – not only if you’re (cough) one of us creepy, nerdy people always hovering behind the screen of players, but even when out in the crowd, listening to the music being more dynamic. Ableton, for their part, have begun spotlighting artists using Push. This is marketing stuff, but they’ve also presented some real techniques you can learn from. That is, they might be trying to sell you Push, but if you’ve got one already, you should pay attention. I’ll go one step further: I love Push, but only after adding some scripting and modifications. Push’s versatility is both its greatest strength and its greatest weakness. While it takes you off the computer screen and mouse, it embodies the functions of the software – that is, it does a whole lot at once. To handle all those multiple functions across multiple tracks, there’s a lot of toggling to switch functions. Done improperly, that can take you out of the set, leaving you all muddled. MultiMap for Max for Live is one really brilliant solution, as he shows in the video. By assigning multiple controls to one, it makes it possible to command a lot of control at once. It’s also well worth checking out nativeKONTROL PXT-Live for Push (mouthful, that name, sorry). PXT does a lot – this is the script from the same genius scripter who gave you (as the name implies) awesome templates for KORG’s hardware. But there’s one feature alone that makes it worth some cash: you can lock devices, so that switching tracks doesn’t suddenly have you playing the wrong input. I didn’t even bother requesting a review copy; I just sent the guy some cash. You should, too. It’ll change your world, if you’ve got a Push. It does so much, that it’s worth a separate review, but I think while I work on that, Jesse gives you more than enough to play with here. In the midst of a lot of heated discussion of Native Instruments’ new controller keyboards, now is the perfect time to revisit Push, too. Push centers on a grid, not a keyboard, but also features lots of functionality for automatically displaying and controlling parameters without looking at the computer screen. And while Push, like Komplete Kontrol, is built to work with Ableton’s own software, you do get added openness by virtue of Live being a DAW. You can certainly map controls easily not only to Ableton instruments, but plug-ins. Now, if Ableton were to built Ableton Play – Push on a keyboard – well, we’d have quite a horse race. (Um… Ableton Ivory? No. Ableton Keys? Hrm.) I’m actually curious if any keyboardists have a Play alongside. There are other ways to skin a cat, too; sometimes a Roland Handsonic alongside a Live set is more fun to watch, minus all this step sequencing business. But it’s fun to watch the “I’m sequencing and finger drumming and clip triggering and playing tunes all at once” workflow evolve. Public service announcement: I think Max for Live means that Live 9 Suite really makes more sense. If you haven’t upgraded, and you are invested in the Live way of life, now is a good time to spring for the upgrade – everything is on sale now, through the 10th of September. I don’t normally post such discounts, but when my office mate is even using this coupon, it’s worth sharing.